Six each of cook in the pouch entrees. Just add hot water and wait 12 minutes. 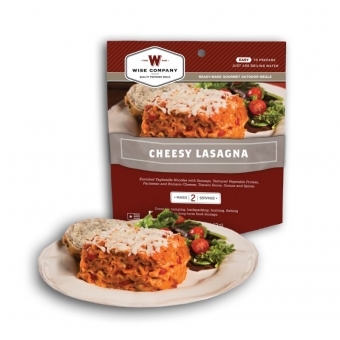 The Wise Food Freeze Dried meals are ideal for camping, hiking, or keeping in your Bug Out Bag. The extra strength Mylar Foil pouch allows users to simply pour hot water into the bag and wait. In about 12 minutes users will be treated to a tasty and nutritious meal. Product weight of only 5 ounces means you can carry plenty of food without adding too much weight to your pack. The cheesy lasagna entree has a shelf life of 7 years. The package contains six each pouches. Each pouch holds two 10 ounce servings that you can cook in the pouch. Just add hot water and wait 12 minutes and it's ready to eat! Wise foods are an excellent option for those wishing to be prepared to provide for themselves or their families in times of an emergency. All Wise Food Outdoor Meals now contain real meat and have increased calorie content ranging from 500 to 780 per pouch. Additionally, the protein per pouch has increased to as high as 34 grams. The Wise Food Company's dedication to quality ensures a safe, nutritious product that will be there when you need it. Open package at tear notch and remove oxygen absorber from the pouch. Add 2 cups (16 oz.) of boiling water to pouch and place on a at surface. Stir thoroughly with a long spoon and close zipper. Let stand for 12 to 15 minutes. Caution! Hot steam inside: use caution when opening pouch. Ingredients: Pasta (durum semolina flour [wheat), niacin, ferrous sulfate (iron), thiamine mononitrate, riboflavin, folic acid, Sausage (freeze-dried pork, salt, spices, sugar, sodium phosphate),Textured Vegetable Protein ([soy flour, caramel color], soybean oil, salt, natural flavoring [yeast extract, maltodextrin, natural smoke flavoring], dextrose, spices, garlic powder), Dried Tomatoes, Sweet Whey Powder, Parmesan & Romano Cheese (pasteurized part-skim milk, salt, cheese culture, enzymes), Food Starch-Modified, Potato Flour, Salt, Non Dairy Creamer (partially hydrogenated soybean oil, corn syrup solids, sodium caseinate [a milk derivative], mono and diglycerides, sodium citrate, salt, dipotassium phosphate, carrageenan, natural flavor), Natural Romano and Parmesan Flavors (salt, yeast extract), Sugar, Paprika, Onion Powder, Garlic Powder, Guar Gum, Beef Flavor (hydrolyzed soy protein, salt, maltodextrin, corn syrup solids and soybean oil), Partially Hydrogenated Soybean and/or Cottonseed Oil, Spices, Extractives of Paprika and Turmeric, Citric Acid, Caramel Color.